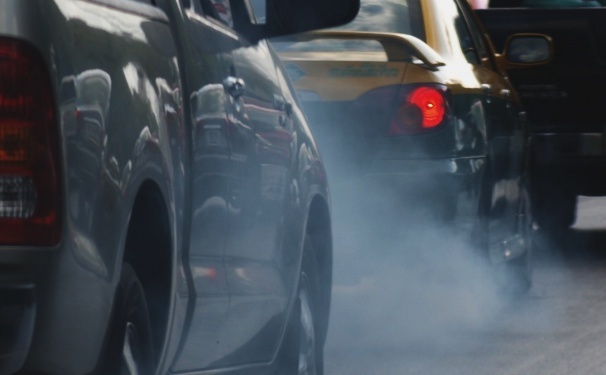 ClientEarth, a member of the Healthy Air Campaign, has taken the UK Government to court over the illegal levels of nitrogen dioxide (a harmful pollutant which mainly comes from diesel vehicles). Last year, the UK Supreme Court ruled that the Government was breaking the law by failing to ensure that legal limits of this pollutant were met. 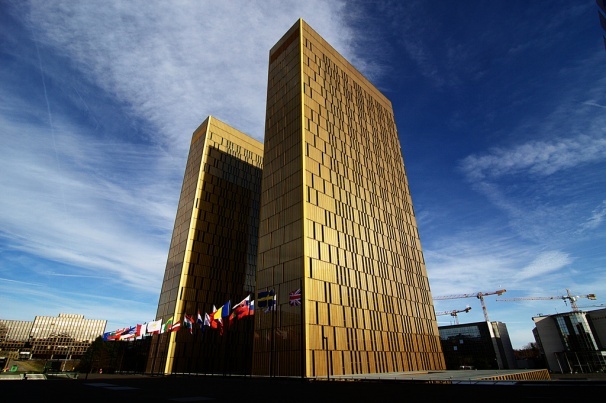 The case will return to the UK Supreme Court for a final ruling next year, when judges will apply the ECJ’s ruling to the facts in the UK case. This could result in the Supreme Court ordering the government to draw up a new plan to meet limits in a much shorter timeframe than they have currently planned. 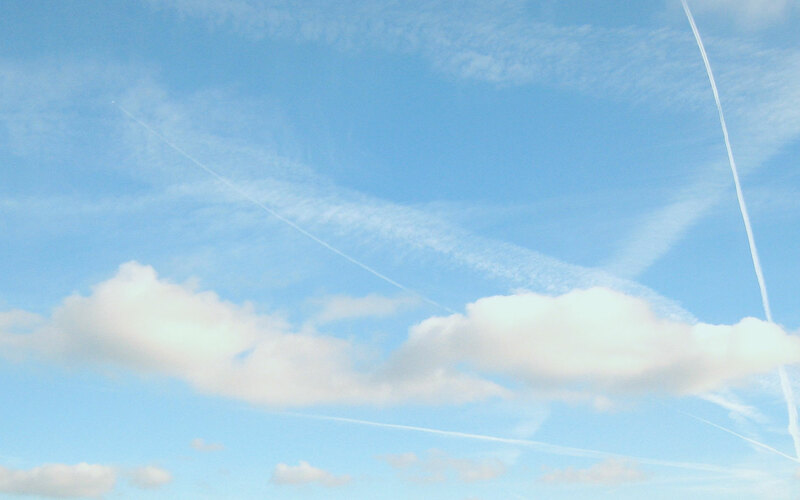 Nitrogen dioxide is devastating for public health. Research is mounting all the time about the problems it can cause or exacerbate. The World Health Organisation (WHO) has declared diesel exhaust, which is the main source of nitrogen dioxide on British roads, to be carcinogenic. This needs to stop. The UK needs to quickly and dramatically reduce the levels of nitrogen dioxide on the streets, and put an end to this invisible killer. But, so far, there’s been little action so far from successive Governments. What ClientEarth have shown is that we all have a right to clean air, but that right is not being enforced: the law is being broken and we’re all paying the price. The legal limits for air pollution come from an EU law called the Ambient Air Quality Directive. In this directive, the annual mean limit for nitrogen dioxide is 40 micrograms per cubic metre (µg/m3). 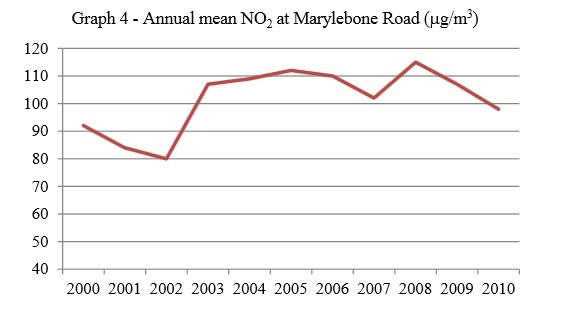 For comparison, King’s College discovered the annual mean recorded on London’s Oxford Street in 2013 was 134 µg/m3. More than 3 times the limit! The UK is divided into 43 zones for the purposes of measuring air pollution, and EU limits need to be achieved throughout the zone; if limits are breached along just one busy street, the whole zone is in breach, and if only one zone breaches, the whole country has breached. ClientEarth listed 17 zones in their legal case, that all had sky high levels of nitrogen dioxide. Meanwhile, according to Defra’s Air Quality in the UK 2013 report, only 5 zones in the UK didn’t breach the annual mean limit last year. So the UK isn’t just breaching this limit slightly, in one or two places; this is a huge problem across the country. Government projections are that, under existing plans, many areas in the UK will be breaching the limits for years to come – London, Birmingham and Leeds will have illegal air until after 2030! Are the legal limits safe? Unfortunately, not. Evidence shows the air we breathe could still be harming our health, even if air pollution is under the legal threshold. So even if a country is abiding by air quality law – which the UK very much isn’t – its citizens could still develop health problems from breathing in harmful pollutants. This is why the WHO has stated we need much lower, stricter limits for all pollutants, than the EU currently has in place. The Healthy Air Campaign, of which ClientEarth is a member, is calling for the UK Government to work towards WHO recommended limits. We all deserve to breathe clean air. Why is the UK breaching? Well, nitrogen dioxide primarily comes from the exhaust of diesel vehicles. The bad news for our health is that the UK has ALOT of diesel vehicles. Graph from Clean Air in London’s diesel report. Wrongly identified as more environmentally-friendly than petrol, diesel has been promoted by successive governments through taxation and other mechanisms. This has worked all too well and, in recent years, diesel cars have been outselling petrol cars. The amount of diesel on the roads is the primary reason why the UK is breaching limits. So, for our health and for legal requirements, the UK Government needs to reduce diesel traffic, and therefore diesel exhaust fumes, in towns and cities. The best way of doing this is a national network of low emission zones – areas in town centres that restrict traffic, and encouraging walking and cycling. Without a national network of low emission zones, the UK will find it very difficult to reduce nitrogen dioxide. People who live, work, travel or spend any time in urban areas will still be breathing carcinogenic fumes every day, for years and even decades to come. What will the judgment mean? This will be the European Court’s first ever ruling on the EU air pollution law, so it could be significant. It will determine what action the UK courts take against the Government. It will also set a precedent in EU law, meaning other legal cases could be launched across Europe if national governments don’t protect people from air pollution. Share this article, and spread the word on twitter. For updates on the case, keep your eyes on our website.